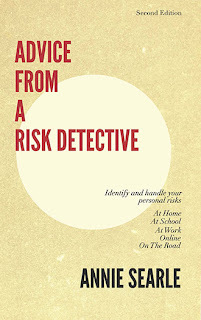 Sometimes the work we do on the consulting side line up with risks I've discussed in my new book. A good example is this month's ASA newsletter that was published this morning. In my column, I discuss several key risks that businesses and corporations are facing in 2012. The risk I discuss that applies equally to individuals and to government and the private sector is from an increasing number of volatile weather conditions around the country. There were ten large events in 2011, each costing $1 billion or more. "When it's a hurricane we usually have days to batten down the hatches, but when it's a tornado or a flash flood or even an earthquake, we are dealing with miniscule amounts of warning time." What can you do now to minimize the inconvenience of a major disaster in your region of the country? In the first chapter of the book, I describe the creation of a neighborhood disaster preparedness group that covers 300+ homes via 17 coordinators. It's part of a City of Seattle program called SNAP (Seattle Neighbors Actively Prepare). Tonight we gather to assemble our first tool, called a coordinator's clipboard, which will contain a map of the neighborhood showing locations of shelters and first aid stations during a disaster as well as the neighborhood site/command center. On that same clipboard will be contact information on other coordinators. Most importantly, there will be a "grab and go" checklist for the coordinator to use in assessing the area she/he is responsible for -- and then in making a report in to the neighborhood command center, which can in turn make a report to the City of Seattle on any special issues that need to be addressed. In creating this structure, we have done everything we can to make ourselves self-sufficient and not to rely upon key city services for up to 72 hours. This program can be adapted to any neighborhood, any city, any region. The materials are all right on the City of Seattle's website at http://www.seattle.gov/emergency/programs/snap/. First television interview on the book!